Health, psychology, weight-loss, pregnancy and motherhood, training, racing; all from a female runner's angle. Health, psychology, weight-loss, pregnancy and motherhood, training, racing; all from a female runner’s angle. These facts and tips cover health, psychology, weight-loss, pregnancy and motherhood, training, racing and more. Some apply to all runners, but most address the specific needs of women. You may find things you already know, but we’re sure you’ll discover new ideas that can help you to become the runner you want to be. 1. Running is a state of mind. The only thing that determines your success, or lack of success, is the way you think about your running. If it works for you – if it relieves stress, burns kilojoules, gives you time to yourself, enhances your self-esteem – then it doesn’t matter what any other person or any stopwatch says about your running. 4. Fast running burns more kilojoules than slow running, but slow running burns more kilojoules than just about any other activity. In short, nothing will help you to lose weight, and then keep it off, the way running does. 5. Doctors consider that moderate exercise during a normal pregnancy is completely safe for the baby. Running should cause no problems in the first trimester and it should be fine for most people in the second trimester. Few women would run in their final three months, however. The most important precaution is to avoid getting overheated; a core body temperature above 38°C could increase the risk of birth defects. So make sure you’re staying cool enough, and if in doubt, take your temperature after a run. If it’s over 38°C, you’re probably overdoing it. Also, skip that post-run soak in a hot bath. 8. 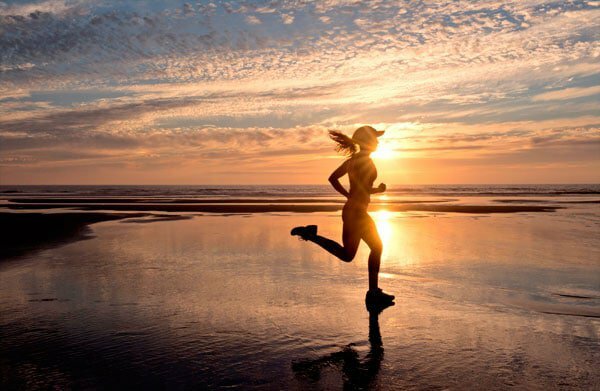 Running women produce a less potent form of oestrogen than their sedentary counterparts. As a result, female runners cut by half their risks of developing breast and uterine cancer, and by two thirds their risk of contracting the form of diabetes that most commonly plagues women. 13. Note: women who train intensively, have been pregnant in the past two years or consume fewer than 10460 kilojoules a day should get more than routine blood tests for iron status, since these test only for anaemia, the final stage of iron deficiency. Instead, ask for more revealing tests, including those for serum ferritin, transferrin saturation and total iron-building capacity. 19. If you were a regular runner before you became pregnant, you might have a bigger baby – good news, since, up to a point, larger infants tend to be stronger and weather physical adversity better. Researchers found that women who burned up to 4180 kilojoules per week through exercise gave birth to babies weighing five per cent more than the offspring of inactive mums. Those who burned 8370 kilojoules per week delivered babies weighing 10 per cent more. 23. Trying to lose fat by eating less and less and running more and more doesn’t work. The more you exercise and the less you eat, the more likely your body is to ‘hibernate’. That is, you’ll conserve kilojoules and thwart your efforts to lose fat. The better bet is to exercise reasonably and increase your food intake early in the day to fuel your training. Eat breakfast, lunch and an afternoon snack. Then eat lightly at dinner and afterwards.